Disclaimer: Kid Uno is a strong, voracious reader. She will read anything I throw at her. This year will probably look different for my other kids, who may not be at a similar reading level at this age. (Daily) Continue reading Third McGuffey Reader aloud daily (probably moving on to the Fourth). Define vocabulary words, talk about grammar and types of writing, correct pronunciation. (Daily) Copywork from the Pentime Grade 6 Cursive book, about 1/3 of a lesson each day. Move to next level when she finishes. (2-3 Weekly) Begin dictation: study a sentence from McGuffey or a lit book, write as it’s dictated slowly, compare, and correct. (Daily) Work through the third year of Ray’s Practical and Ray’s Intellectual as recommended by the Eclectic Manual. The Ray’s Test Examples has extra problems for more practice, and the Ray’s Key is coming in handy for checking. Memorize multiplication and division flashcards at the beginning of the year to improve speed. (2-3 Weekly) Work through the rest of Miquon series (starting with Blue), probably 6-9 pages weekly. (Weekly) I’ll read her one or two lessons from the Life of Fred series (picking up where we left off in Edgewood). Or she will read independently because I am getting tired of Fred. She’ll write the answers on paper or a whiteboard. (Weekly) Choose a living math book to read for 20-30 minutes. I need to find more titles from the living math list. (Daily) We usually read to all the kids from Egermeier’s or The Jesus Storybook Bible or DH reads through a book of the Bible. (2-3x Weekly) We (or I) will pick 1-2 lengthy passages per term for Kid Uno to memorize. I might also assign some lists to memorize (like the books of the Bible). (Weekly) Read one Saints: Lives and Illuminations with Kid Dos. (Daily) We’ll take turns reading the scheduled AO poets. I’m dropping Longfellow (he’s scheduled again in Year 5, I believe) and replacing him with Vikram Seth and Marilyn Singer (for fun, and to branch out from American/British poets). (2-3x Weekly) Kid Uno will memorize and recite 1-2 poems per term. We are not at all following the AO history progression anymore. We are doing an overview of world history by reading A Child’s History of the World (the updated, not-racist version). One or two chapters a week. We read half in Year 2, and will finish it this year. We aren’t using any of the AO scheduled biographies this year. They are scheduled based on AO’s history progression, so I’m subbing my own biography choices. I have all 51 titles in the Signature series. Kid Uno read most of them in Year 2, and if she doesn’t finish them during vacation (for fun–not assigned), she can continue reading at least one each week. She will read the book, narrate to me, find some places on the globe, and put some people/dates on her timeline. When she finishes that series, I will probably select some of the easier ones in the Landmark series, and assign them the same way. And/or read the bio of Teresa of Calcutta, scheduling about 1-2 chapters per week. Another option might be some of the Who Was series, which a friend of ours really likes (but I haven’t looked at them yet). They might especially be good for reading about more modern (post 1960) people. Trial and Triumph: I dropped this permanently. Dislike the writing, and disagree with the religious POV. I printed a free timeline from SCM and put it in a 3 ring binder. Every couple weeks, Kid Uno will add some names and dates from our readings. This will probably be the last year; in Year 4 she will probably start some version of a century book. I’m moving Minn of the Mississippi from Year 4 to Year 3. I’d like to be done with the Holling books this year, and it will tie in nicely with my literature substitutions this year. 🙂 I’m scheduling one chapter per week. I will probably move Marco Polo to Year 4, as I’m planning some sort of explorers theme for Year 4 history and geography. I like the Demi, Freedman, and Walsh Landmark versions best. When we finish Minn (week 20), I’ll schedule a couple books from Mater Amabilis geography people and places for this year. They are a nice intro to Russia and China as big countries with many regions and people groups, and a gentle introduction to communism. Sovietrek: A Journey by Bicycle Across Russia, The Children of China: An Artist’s Journey, A Little Tiger in the Chinese Night: An Autobiography in Art. We will map them as we read. The other Mater Amabilis geography books are on Kid Uno’s free read pile (they are fiction). We’ll continue using the globe and maps to find places we read about. Our science is also not looking at all like AO! Handbook of Nature Study: I don’t use this at all. It’s for the teacher, not the student. It’s not open-and-go, and I think there are better modern options. Instead, we did the first half of Building Foundations of Scientific Understanding for Year 2, and will finish the second half this year. I try to find the suggested supplemental books at the library, and let Kid Uno pick a few to read. I may (or may not) have her do Nature Connection again this year. There are still activities she can do in the calendar section, and it might be neat to see how her work is different from Year 2. But if her workload is too heavy, this will be the first to go (or maybe do it once a month). (Weekly) She’ll also keep a nature journal through the year. I usually assign her something specific outside to draw or paint. I might make it more methodical this year. For example, pick six different trees in our neighborhood. Spend one week drawing the shapes, another week the twigs and leaves, another time the flowers (or seeds, cones, berries, etc. ), another week a bark rubbing and leaf rubbing…Another theme could be drawing an insect, an arthropod, a crustacean, a mammal, a bird, etc., paying attention to the differences. We will read four of the One Small Square series, with Kid Dos. There are twelve books, and I plan to read them all in Years 1-3. They cover various habitats, with the various animals and plants that live there. Secret of the Woods: dropping this (I find it annoying, and not the most effective way to learn about nature) (if I can find a cheap copy, I’ll add it to free reads). Subbing Wild Season, which I like a lot, two chapters per week. Among the….People. They are much more palatable. If we read 33 chapters per year, we will read all the books by Year 3. Kid Dos will be listening too, this year. I’m also dropping Children of the New Forest and subbing Tom Sawyer. Kid Uno has been begging to read Tom Sawyer, and I think it is a much, much better book than COTNF (but is only a free read in Year 5???) I’m glad I pre-read COTNF–it was very long, predictible, unbelievable, and had such flat characters…or maybe I just didn’t like it and can’t imagine reading it aloud…it’s going on the free read pile. And I am scheduling American Tall Tales much faster, and adding The People Could Fly. Great African-American folk tales. For Shakespeare, we read Lamb’s. Then sometimes listen to it on Librivox. Then sometimes watch a movie version. Kid Dos will join this year. Pilgrim’s Progress: Read Christiana’s journey. (Daily) Drawing Lesson: She is interested in fashion and figure drawing, and wants to work on colored pencil. I have a couple of books she can pick from, so I think I’ll let her choose what she wants to work on each term (or month), and do a little bit daily. (Weekly) Continue art projects from Scott Foresman. I think she left off on Grade 3. (Weekly) I picked one artist per term (Georgia O’Keefe, John James Audubon, and Salvador Dali), and bought a coffee table art book by each artist. I’ll pick one painting each week for Picture Study. Kid Uno is a reader–she has read most of the the AO Free Reads for Years 3 and 4, so I’ve been using other book lists to compile a large stack for her. Maybe soccer again in the spring? Maybe ballet again? Maybe baseball with Kid Tres? Maybe children’s theatre or a membership to the natural history museum this year? At the end of each term, DH will do exams with Kid Uno. I’ll use the AO exams for Year 3, tweaking to fit the books we used. So that was the first time planning Year 3! This entry was posted in Ambleside Online, Year 3 and tagged AO, Charlotte Mason, curriculum, Education, homeschool on June 23, 2016 by marisolstice. This is how we did Year 1 with Kid Uno. I’ve noted where we have dropped, added, or substituted books. I’ve also noted changes planned for Kid Dos. (Daily) Kid Uno read aloud from the First McGuffey Reader. We defined vocabulary and talked about punctuation. (Daily) Then we worked through The Ordinary Parent’s Guide to Teaching Reading. We flew through several lessons a day but it was awfully dull. Looking for an alternative for Kid Dos. (Daily) After finishing that, she moved on to reading aloud from the Second McGuffey Reader. She’ll continue it in Year 2. (Daily) She worked through the Grade Two and Grade Three penmanship workbooks from Rod & Staff, spending about 5-10 minutes a day completing a lesson or half a lesson. (Daily) We worked through the addition and subtraction sections of Ray’s Primary Arithmetic. Twice! The first time through sequentially with beans and marbles; the second time through alternating addition with subtraction, mostly working out the problems in her head. Then we worked through the addition and subtraction exercises in the Eclectic Manual. (Weekly) I read her one or two lessons from the Life of Fred series. She wrote answers on paper or a whiteboard. (Weekly) She did several pages from the Miquon Orange and Red books. I assigned the pages, sometimes explained how to do things, and corrected them. (Weekly) Kid Uno read aloud the passages scheduled by AO, and then narrated. Sometimes we discussed the reading. (2-3x Weekly) At the beginning of the year, I had printed the free verse packs from Simply Charlotte Mason. Kid Uno picked one each week to memorize. They were short, but totally out of context, and she didn’t really remember them. So for the 3rd term, I picked Psalm 136, and we memorized it together. That was much more satisfying! (Daily) We took turns reading the scheduled AO poets. We read the three scheduled American History bios and also added Pocahontas by the d’Aulaires. Our Island Story: We read this as scheduled the first two terms, and then I dropped it. I am thinking of using it in Year 4, but it’s too much British history for us, and a slightly over the head of a 7 year old. Fifty Famous Stories Retold and Viking Tales: Read as scheduled but not all the chapters were scheduled. I assigned the remainder to Kid Uno to read herself, and narrate. For Kid Dos, I plan to schedule all the chapters in these two books in lieu of Our Island Story. Trial and Triumph: Read as scheduled. I printed a free timeline from SCM and put it in a 3 ring binder. Every couple weeks, Kid Uno added some names and dates from our readings. Paddle to the Sea: We read as scheduled. We used a little globe and a big US map to find places we read about. Handbook of Nature Study: We didn’t touch it, and I don’t plan to. It’s for the teacher, not the student. It’s not open-and-go, and I think there are better modern options. I’m considering using The Amateur Naturalist and/or The Nature Handbook: A Guide to Observing the Great Outdoors for the other kids and future years. (Weekly) Instead, we used Nature Connection. We started with the weather section, since Kid Uno is into weather, and then finished with the naturalist section. We’ll do the monthly section in Year 2. (Weekly) She also kept a nature journal through the year. I usually assigned her something specific outside to draw or paint. (Weekly) We also read three of the One Small Square series. There are twelve books, and I plan to read them all in Years 1-3. They cover various habitats, with the various animals and plants that live there. James Herriot’s Treasury and The Burgess Bird Book for Children: We read these as scheduled. James Herriot was great; Burgess Bird not so much. Kid Uno picked up a little info about birds, but I can’t stand reading it aloud, so it will go in the Free Read pile for the next kids. For Kid Dos, I will probably keep the AO theme of birds, but use The First Book of Birds. And maybe something by Jim Arnosky or John James Audubon. For Shakespeare, we read Lamb’s. Then listened to it on Librivox. Then watched most of the plays on YouTube. (Weekly) I picked one artist per term (Caravaggio, Van Gogh, and John Singer Sargent), and bought a coffee table art book by each artist. I picked one painting each week for Picture Study. (Daily) Kid Uno did one lesson daily from Drawing Textbook (unless she had another art project scheduled). At the beginning of the year, I bought all the art supplies for the Usborne Art Treasury, and set them aside for school. Kid Uno picked one project every other week, and did it herself. On alternate weeks, she did free YouTube drawing lessons by Shoo Rayner, Mark Kistler, and Jan Brett. Kid Uno and Kid Dos took four lessons at a little art studio. (Weekly) We bought the Classical Kids set of CDs, and I split them up fairly evenly (and in chronological order) to be listened to through the year. I’m not sure they were worth the cost; we’ll see how Kid Dos likes them. Both girls love watching ballet on YouTube, so they also listened to a lot of classical music. Hymns: I asked DH to pick some favorites, and then printed and filed them. We sang them together a couple times a week (and went over the vocabulary). We sang four Christmas hymns during Advent, and about one per month the rest of the year. They aren’t memorized, but they are more familiar now. Ummm….Spanish very informally? Sometimes the kids watch Kids Love Spanish DVDs (not recommended–It was a gift–the one star reviews are pretty accurate). And sometimes they learn a Spanish word because DH and I speak Spanish to each other when we don’t want them to understand. Kid Uno is a reader. She flew through the AO suggested free reads in the first couple weeks. So I pulled heavily from other booklists the rest of the year. At the end of each term, DH spent about two days doing exams with Kid Uno. I used the AO exams for Year 1, tweaking to fit the books we used. He took notes for me to read later, and I listened in when I could. And that was our first version of Ambleside’s Year 1! 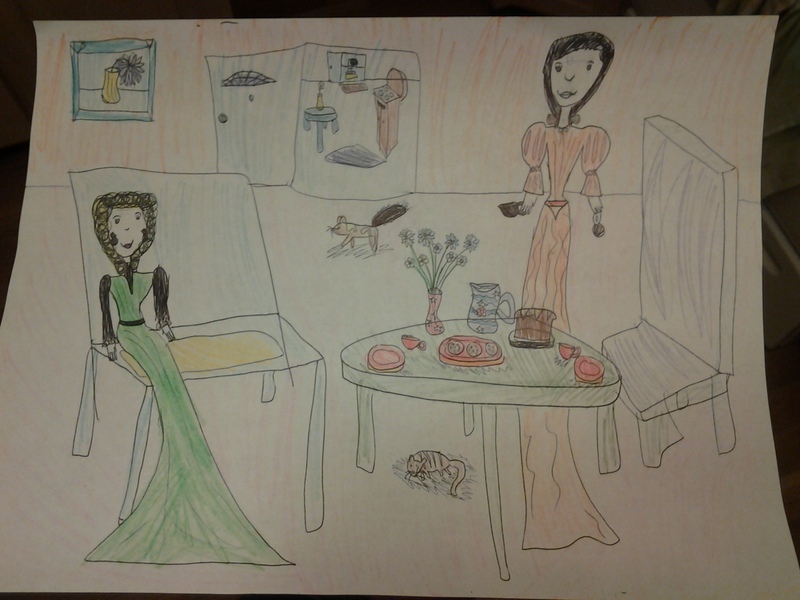 This entry was posted in Ambleside Online, Year 1 and tagged AO, Charlotte Mason, curriculum, Education, homeschool, Year 1 on June 23, 2016 by marisolstice.